Looking for some kitchen coffee bar ideas that will work in your home? 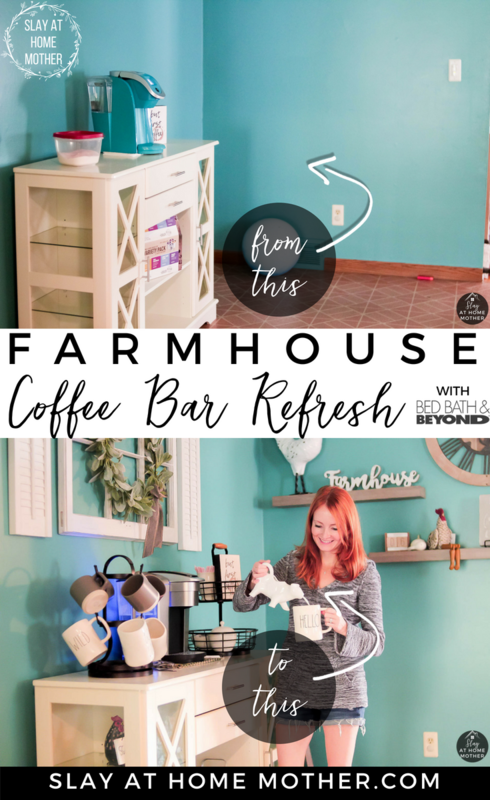 See how I transformed a cabinet and corner in our kitchen into our farmhouse coffee bar and brought new life to our home! This post is in partnership with Bed Bath & Beyond, however all opinions are my own. Hi friends! So coffee is seriously my best friend. I didn’t really appreciate the power behind a cup of joe until we had Jaxson (our second little guy). There are so many second-child memes that are SPOT ON. Where Max was sweet and quiet, Jax is wild and insane. Seriously, he taught himself how to climb a chain link fence just yesterday. I looked up at him from my book after two minutes and caught him as he was already halfway up the fence. Oy. With parenting two kids, coffee went from being a just a tasty drink to an absolute necessity ;). It helps me get through the exhausting days of chasing around a toddler with an apparent death wish, run around to our speech therapy and OT classes, run a business, and stay awake for #AllTheThings. 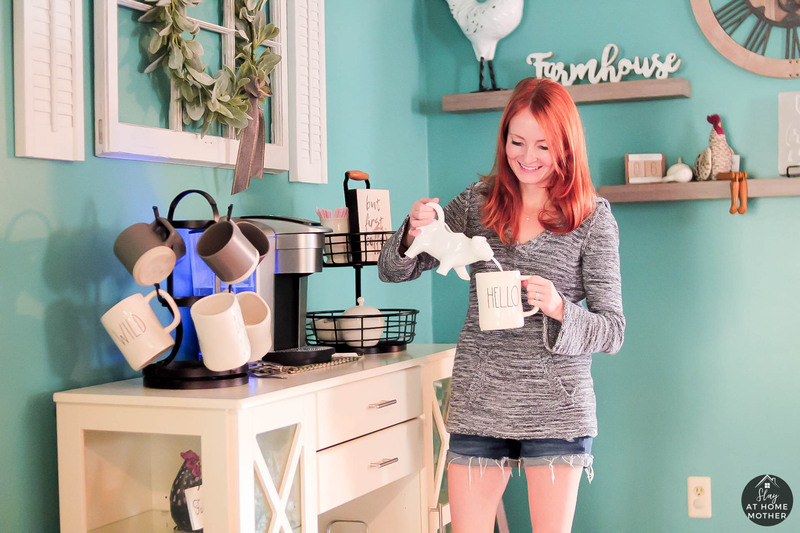 Needless to say, I was really excited to officially dedicate a space just for coffee in my home, and go shopping at one of my favorite stores! I’ve had this lonely white cabinet for a while, and it’s kind of perfect for a coffee bar, but I knew I wanted to make some changes, hang decor, and decorate a bit. 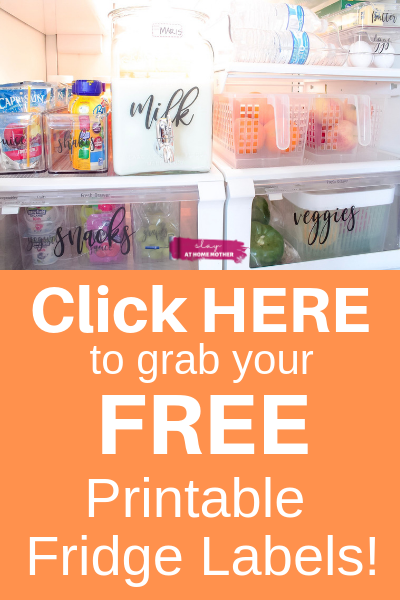 I teamed up with Bed Bath & Beyond for a refresh of this space! Here’s what my coffee bar looked like before. Nothing special. I didn’t even have anything on the shelves in this randomly placed cabinet. 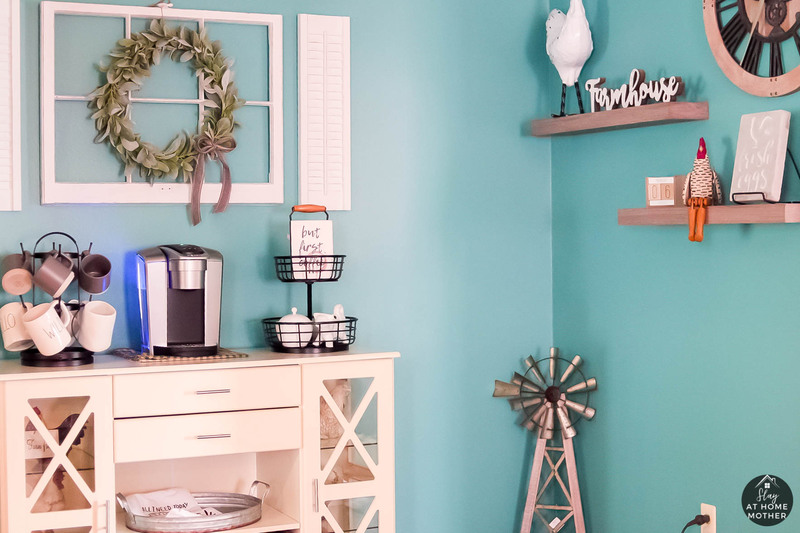 My Keurig and my kitchen walls were the exact same color, so I knew that I was going to need to give up my original turquoise Keurig. 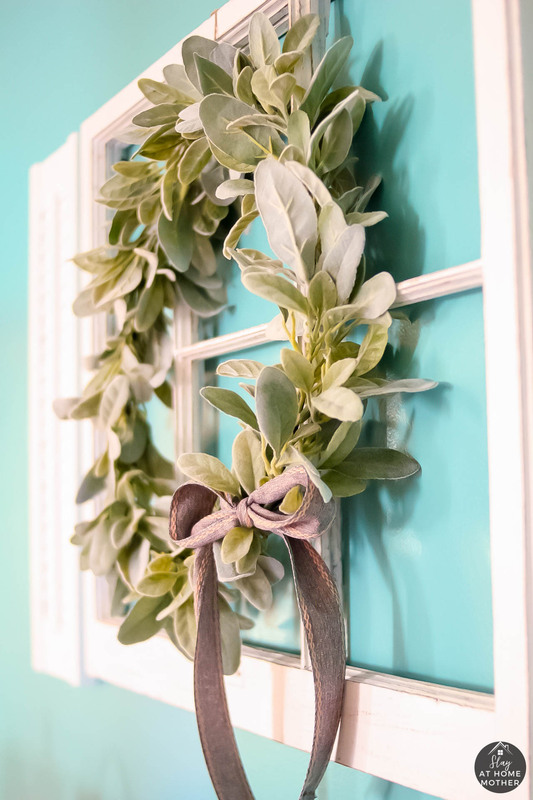 The walls just scream BLUE, which is fine with me because I adore the color, but in staying true to my vision of a farmhouse style coffee bar, I knew I needed to incorporate only neutral colors moving forward. Oh, and yes. That is my super sophisticated sugar container there. I can sense your jealousy. I am ‘BEYOND’ pleased with my new coffee bar. It is beautiful, neutral, and absolutely stunning! Bed Bath & Beyond was wonderful to work with on this project, and I’m just thrilled with how everything turned out. 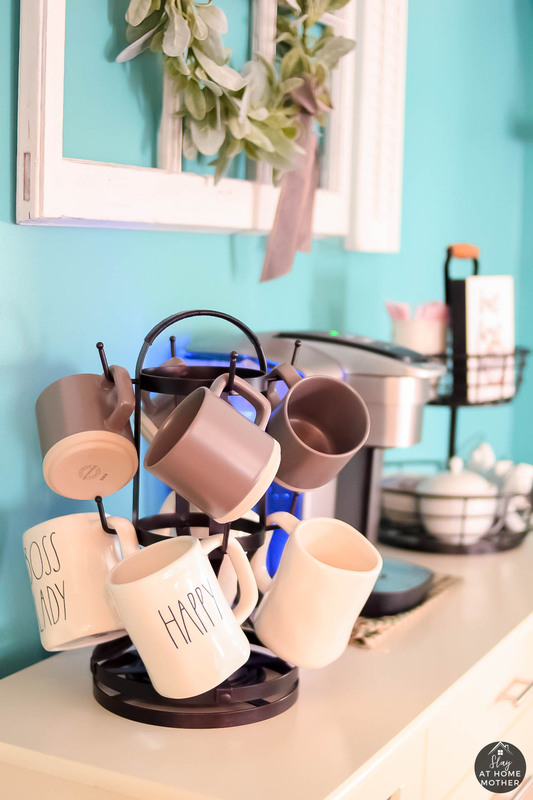 I knew with my coffee bar that I wanted to creatively display our mugs, but still, look clean. 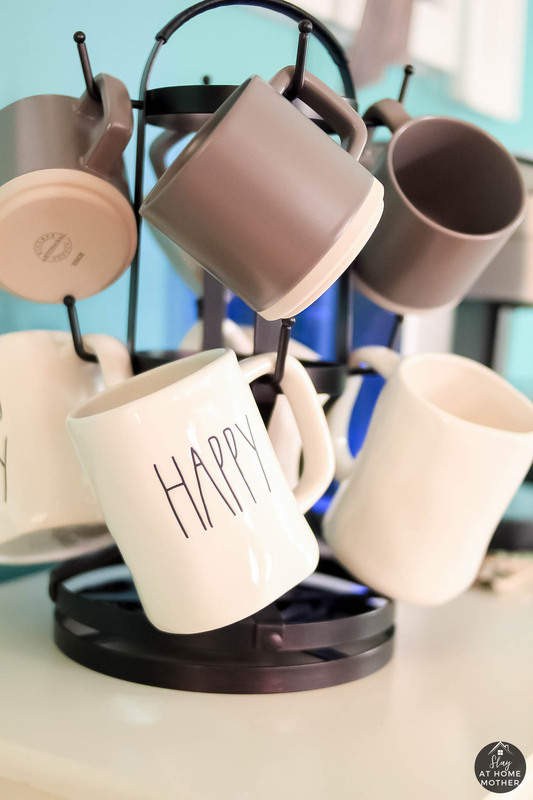 I was over the moon when I saw this rotating mug rack. I originally had a bunch of mismatched coffee mugs which were kind of thrown together in our cabinets above the dishwasher, but now they are nicely kept and accessible on the counter of our refreshed bar. To keep with the farmhouse feel, I decided to snag these new 13 oz. stoneware mugs from Bed Bath & Beyond too, which were only $3.99 each! 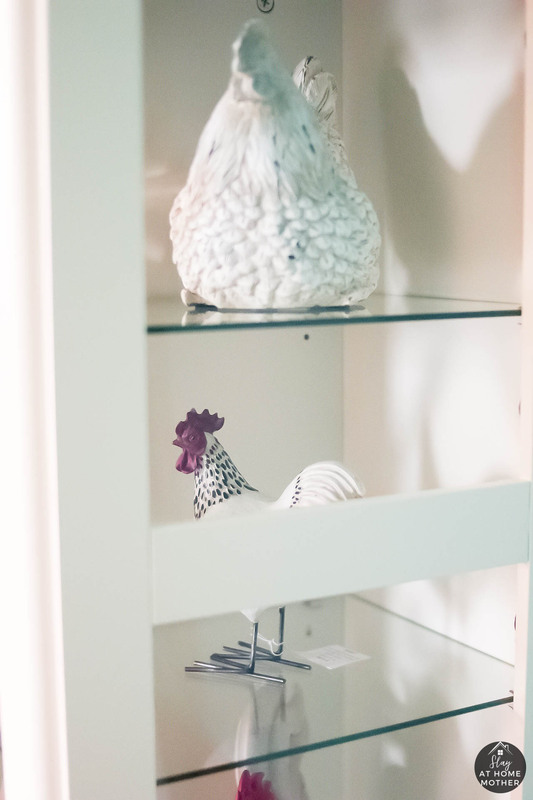 They helped add a neutral look, coupled with some of my Rae Dunn coffee mugs. 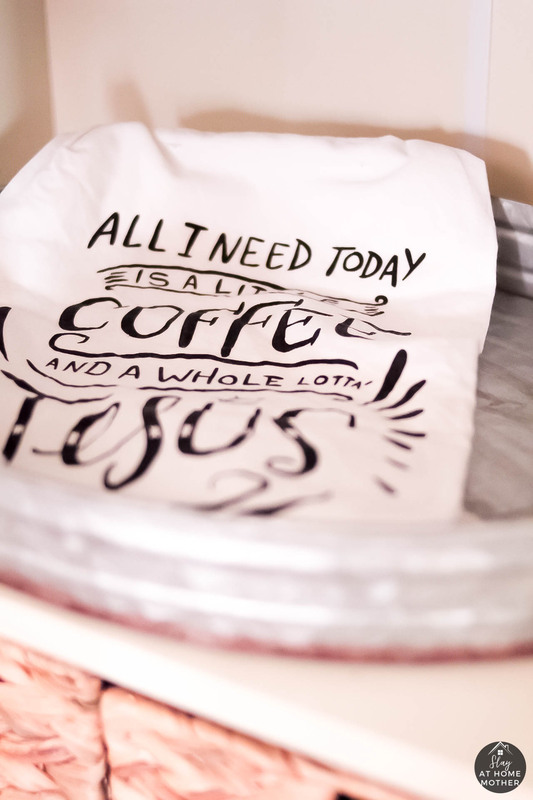 To hold my other coffee essentials, I chose to incorporate this adjustable two-tier basket. 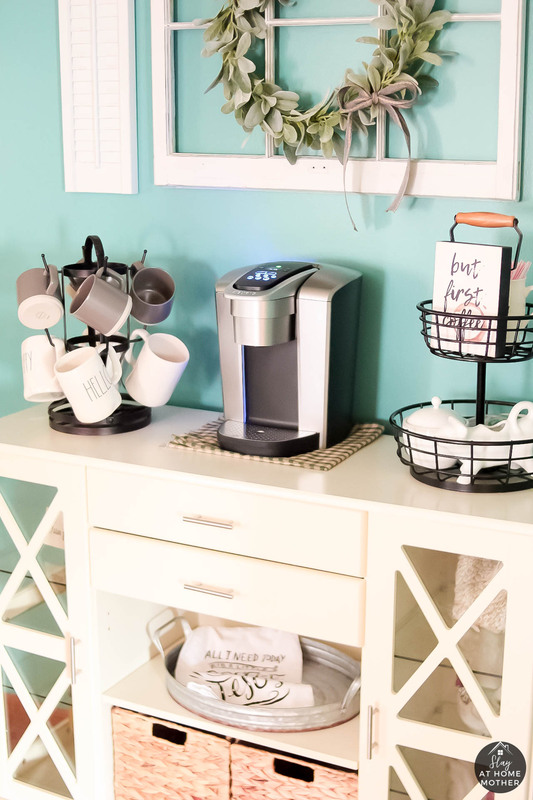 I put some mixing straws, my coffee sign, my adorable cow creamer pourer (if that’s proper English), my new sugar bowl, and some easy to grab K-cups in the baskets for guests. The two-tier basket can be adjusted by spinning the top basket along the iron rod in the center. 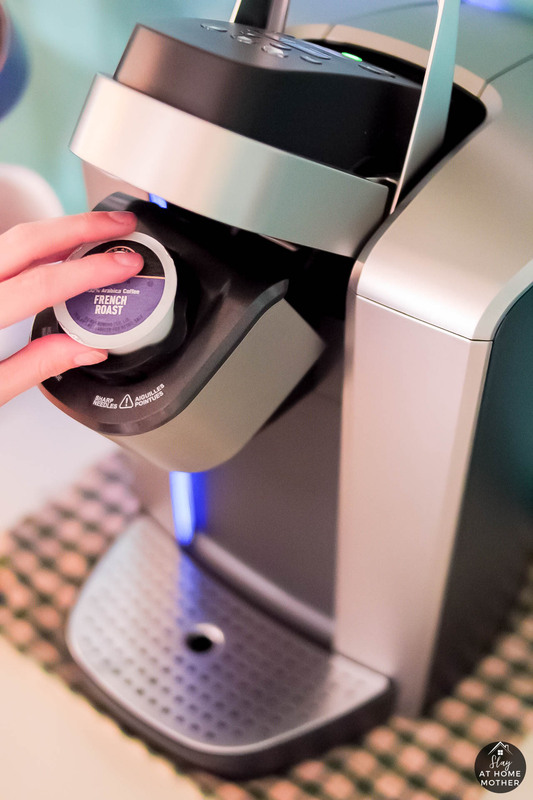 For my morning brew, I changed out my old turquoise Keurig K200 for a new Keurig K-Elite in brushed silver. I can now make iced coffee, or stick with hot coffee. I tend to drink more coffee when it’s hot, but it’s nice to have the option. 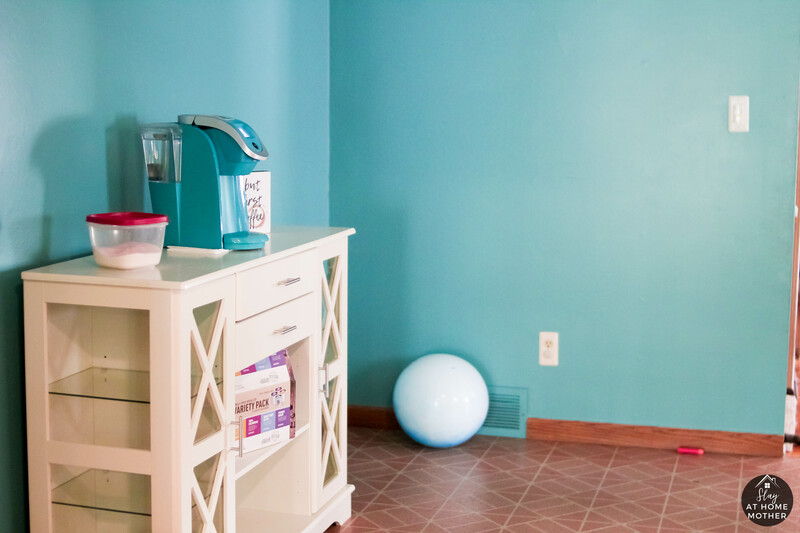 I love the way it looks against our blue kitchen walls compared to the old matchy-matchy Keurig we had. 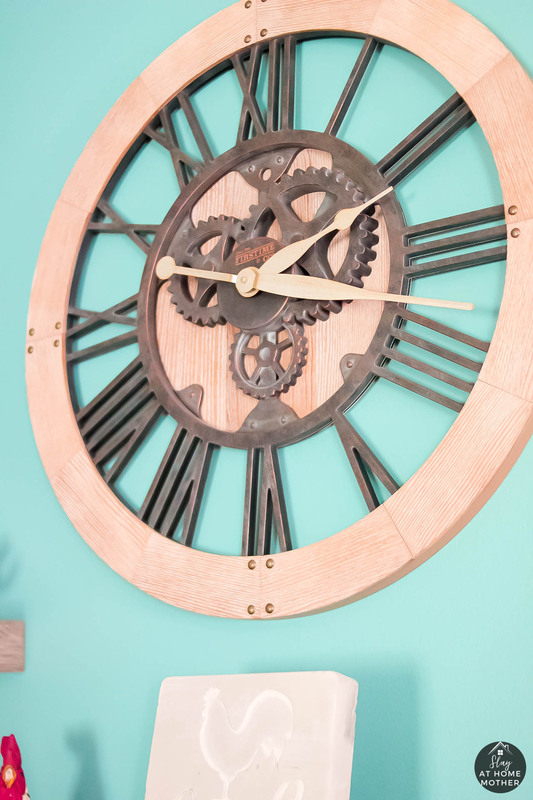 For the adjacent wall, I chose a rustic clock with some faux-gears that Chris ended up loving, paired with some floating shelves (similar) to hold some of our other farmhouse decor. 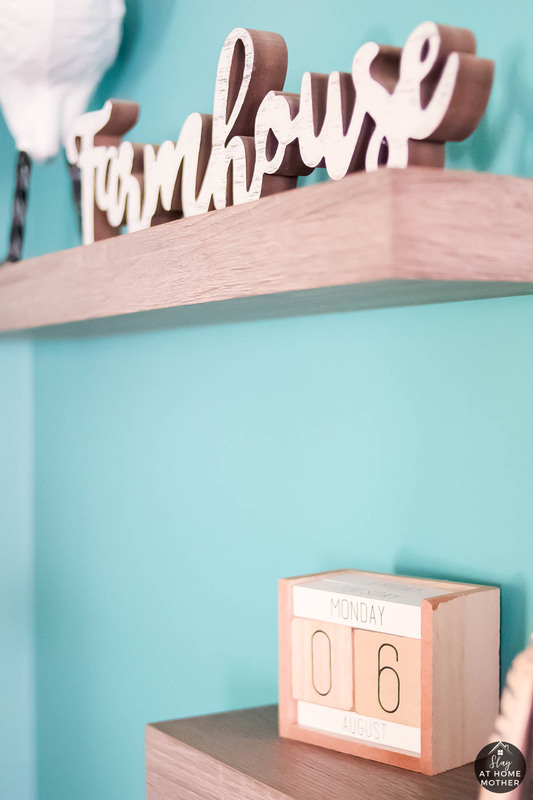 Each shelf is 30″ W x 6″ D, which ended up being perfect for our space. P.S. 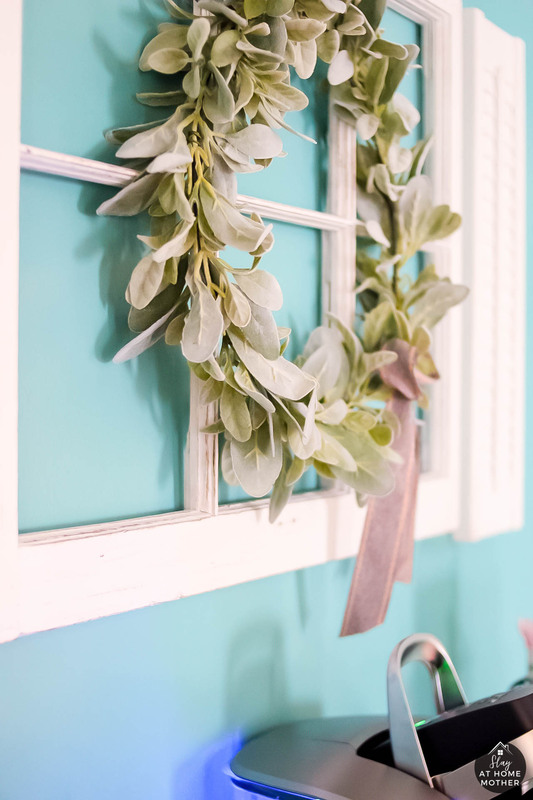 I know I’m going to get a lot of questions about this window shutter set, it’s from Patti at Rusty Nail Designers on Etsy! 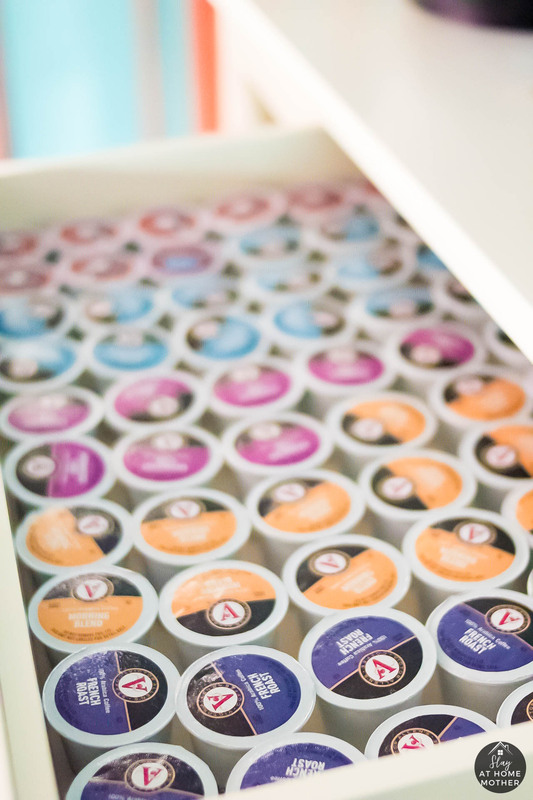 To store my k-cups, I use the first drawer in my cabinet. I also grabbed this variety pack from Bed Bath & Beyond. 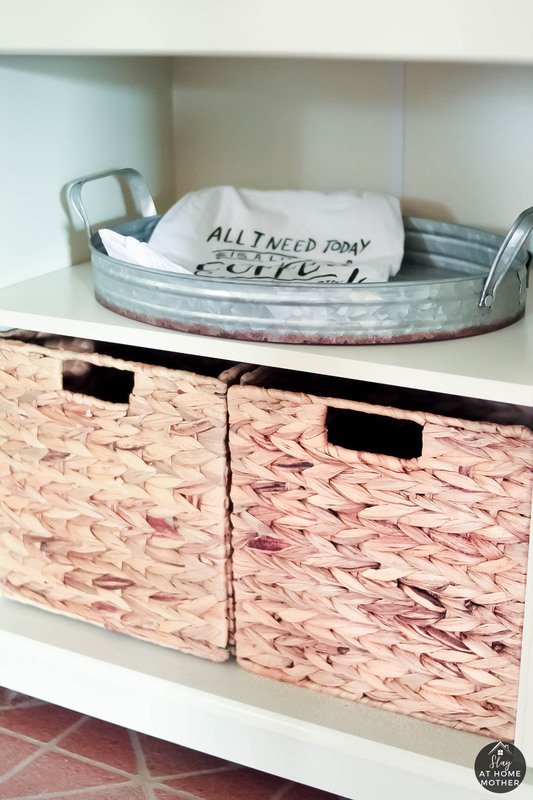 The baskets on the bottom shelf of my coffee bar add the perfect farmhouse touch, along with some extra warmth to my coffee bar. I love that they aren’t identical – one is a tad bit darker than the other. Usually, baskets feel hard or rough – but these baskets are crazy soft! Plus, they were really easy to put together. I was really surprised during my shopping trip at Bed Bath & Beyond by just how many things they had to offer! 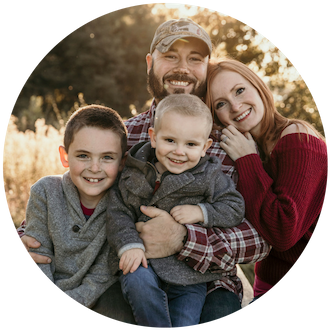 It was hard to shop for only one room, because they have such a nice selection of home decor, furnishings, and products for every space in our home. I could seriously spend hours in that store. And that’s my coffee bar! I can’t believe how good it looks – or that it’s mine! I feel so lucky to have such a beautiful space in my home. 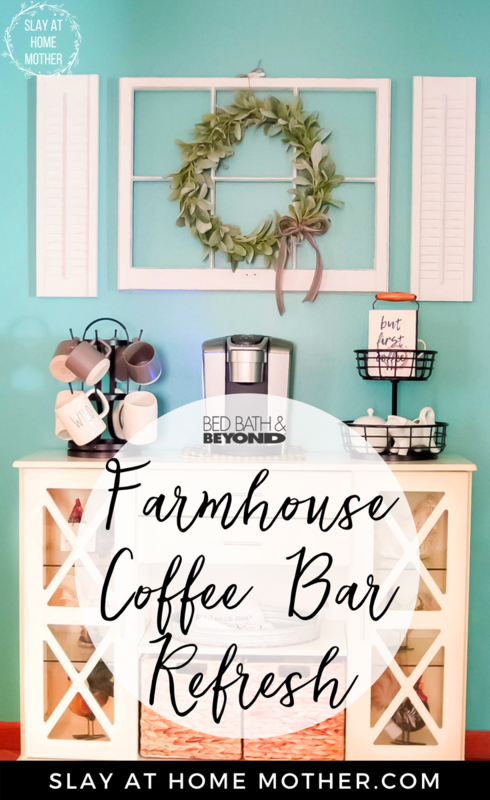 I couldn’t have created this beautiful coffee bar without Bed Bath & Beyond, and their incredible selection of home goods and products. What have you found lately at Bed Bath & Beyond that you’re loving? How do you think my refreshed coffee bar turned out? Share with me in the comments below! When designing my new kitchen, I added a coffee/wine bar. It was the best decision I ever made! I love your coffee bar, it’s so pretty and bright! Great paint color too! 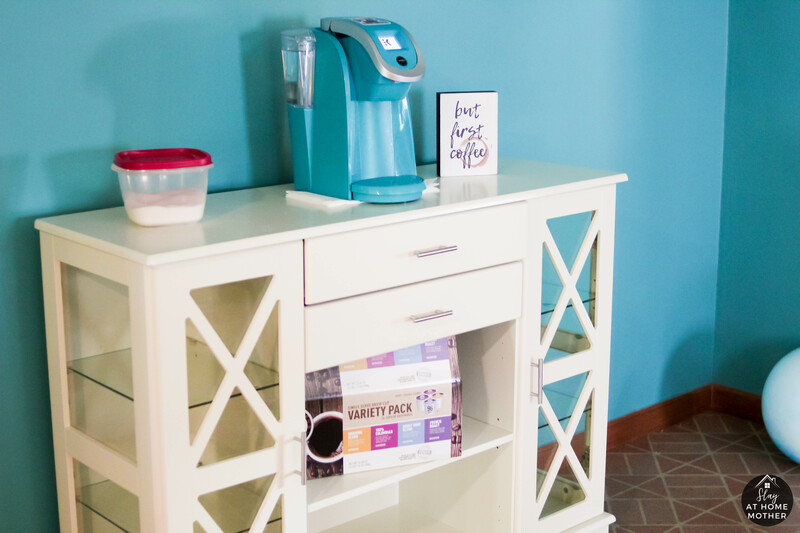 Having a coffee bar is like a dream come true! I wish I had one! This is adorable!! 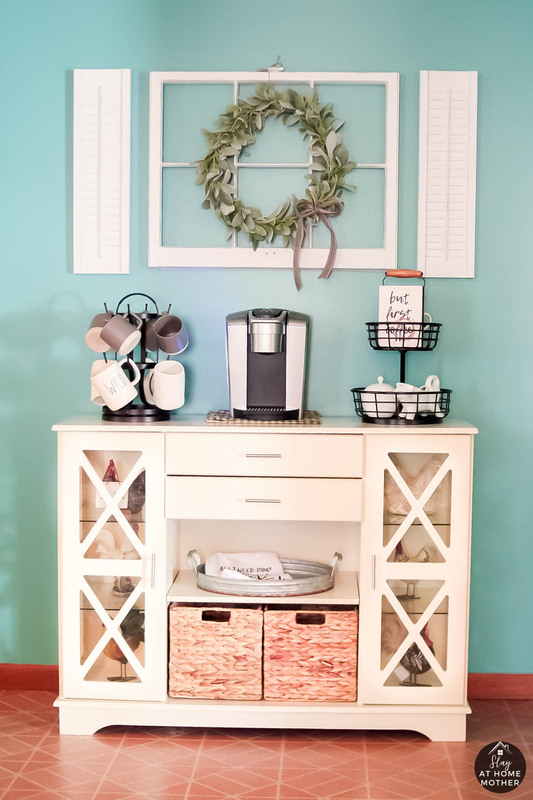 I have a coffee bar that is not nearly this cute and I am inspired to spruce it up a little. Your refreshed coffee bar is just perfect, I’d like to try and take it as a model for a cupboard that I want to refresh by myself. I like the wedding personalized gifts from bedbathandbeyond.com.